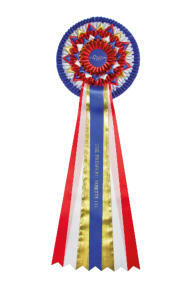 Tracey and Mike Daws, a husband and wife team, have been running The Premiere Rosette Company since 2009. Tracey and Mike are both animal lovers and as children they had a variety of pets, including dogs, a cat, guinea pigs, tortoises, gerbils, a canary, tropical fish, goldfish and even some stick-insects! Tracey also loves horses and she helped out at a local stables and rode regularly right through her teenage years until moving away to go to university. As adults Tracey and Mike have owned a number of dogs, buying their first puppy together, a long-haired dachshund, just six months after getting married. They have shown all of their dogs over the years, attending Crufts with two of them. Their other passion is motorbikes and they have shown Tracey's classic 2-stroke bikes at various shows around the country. All rosettes are made to order so are fully customisable. You can have any colour scheme you want. You are not limited to the rosette designs in our catalogue. If you want something different just ask. A 10% discount applies to orders over £100, 15% discount applies to orders over £500 and a 20% discount applies to orders over £1,000. We occasionally have other offers available so please check our Facebook page regularly. You are welcome to come and visit us at our workshop. Please email or call to arrange a mutually convenient time. We sometimes attend shows in the UK and in Norway if you want to come and say hello. Dates and locations will be posted on our Facebook page. We have shown both dogs and motorbikes so we know what it it like to win a rosette. We are able to print your club logo on the ribbons and this can be used in tails, points or pleat. We have no minimum order. We are able to print full colour digital centres at 20p each. We can do short notice orders if required and we do not charge a premium for this. We have a full colour, printed catalogue available. If you want a copy posted to you just ask. We also do sashes.